The Authenticity Experiment, the Western Weekend Edition. As a kid, I went to Western Weekend in rural Marin County, in a town without a stoplight or a sit-down McDonald’s. I didn’t ride the Ferris Wheel because the swinging cars gave me crawl up and a fear that I’d flip out—literally and figuratively—and plummet to my death. 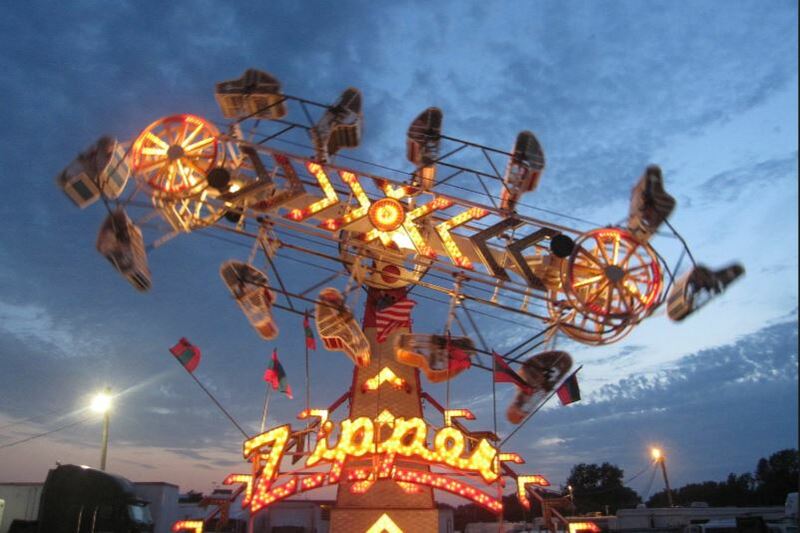 Strangely, though, I did ride the Zipper, me alone in a car. A blue one, I think, but that could just be an artifact of my imagination because now blue is my favorite color. Two of my other friends rode along, each of us in our own car. That ride, so unsafe—cars shooting up three stories then rotating over and over as you propelled down the other side, the smell of motor oil heating up as the gears drove the cars faster and faster—vaguely comforting, I suppose—to know the mechanicals had been lubed when the ride was assembled. (Either that, or the heat of the gears burning off the oil. Hard to say.) 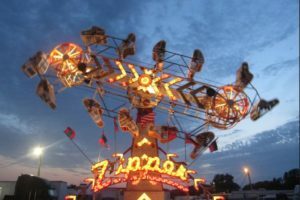 The riders—okay, me for sure—screamed at the greasy, long-haired carnie to let us off each time our cars shot past him at what? 45 miles per hour. Faster? Begging him to stop the ride. I’m sure our sentences were unintelligible because we were moving so fast, because I am pretty certain that every car had a screaming teenager in it. And then finally on the ground again—in what is now a Safeway parking lot—I hurled out who knows what. If I had to guess: corn dog, cotton candy, caramel corn, and Dr. Pepper. My friends wanted to make out with the carnies. What could I say? They wanted to prove, I suppose, or confirm maybe, their blossoming attractiveness. So when the Zipper guy got a break, we went back to his wood-paneled trailer and he kissed one then the other of my friends, sliding his hands under their shirts and over their bras. I watched him mash on my friend with bigger breasts—pushing her breasts against her chest wall, grabbing at her through her bra. We must have only been in 7th or 8th grade. Old enough, I suppose. Young enough, I suppose, too. I left the trailer ashamed and relieved at once. The thought of kissing that man repulsive to me, the shame at not being kissable, burning in me as bright as the midway lights. I was reminded again this week of that old pain of being different, of having to explain my way of being in the world. It isn’t any easier at 52 than it was at 13. I suppose the difference is, now I don’t really care if someone fails to understand me. But this is not exactly true. I do care. Because I do want to be understood. And it often feels like nothing can break that spell. Because Bannon. Because De Vos. Because Syria. Because I was the only genderqueer woman in the French Quarter New Orleans wearing a tie. Because I sat alone in the Preservation Hall, when I was not supposed to be alone—in a linen suit and a bow tie—I sat alone and watched a jazz band play while tears streamed down my face, breaking all kinds of rules. Rules about clothing, rules about public displays of emotion. I was different and I feared I was broken beyond salvage. But here’s the thing, whether you are at Western Weekend, Preservation Hall, or your own house in your own city: you’re no different than anyone else—you just think you are. The trick is to remember that there is someone out there who understands you, who “gets you more than others.” He, she, they—they’re waiting. For you, for me, for all of us. I believe this with my whole heart. Do you love these essays? Will you forward them to your friends and encourage them to sign up to receive them? Just click either link to sign up. Another powerful, empowering piece. Thank you. Thanks, Bob. Thanks for being such a steadfast follower. This piece, much more than just words here, took me to the top in the Zipper and then dashed me down, in tears, when you stumbled on wanting to be understood. This week, I so sadly told someone who has helped me, “known me” for years, “You don’t understand me.” It’s like screaming inside a glass bottle with the cap on. And thank you for the salvation: “The trick is to remember that there is someone out there who understands you, who ‘gets you more than others.’ He, she, they—they’re waiting. For you, for me, for all of us. I believe this with my whole heart.” I believe, too. It’s true, Shelia. They are out there. Kate, essay after essay your writing astounds me. Your honesty and humility makes this world kinder and more beautiful. Thank you! Western Weekend, the Zipper, The Safeway parking lot. All echoes of a past both abandoned and clung to. Fitting in oh so well in some ways, not at all in others. Your writing forces me to reassess the filters that have been employed to manage the past. That’s a high compliment, Bill. Thank you. I remember Western Weekend now that I read your wonderful essay. Brings me back in time! Very much enjoy your writing, Kate. Hope your are well and happy spring! I’m great, Stephanie! Glad you liked the piece. Hope you are well, too. Oh, Kate! You go right to the heart of it every time. I think everyone feels some of what you feel… at least when young, and then forever after from time to time. There are a lot of people who simply lack the courage it takes to live as freely as you do. It’s your beautiful vulnerability and openness that is so meaningful to your readers. I appreciate you and your willingness to live out loud even when it’s painful and scary for you. Thank you.